Single nesting ball. FIber colors will vary. Shipping rate will vary depending on your location and when you want the item delivered. Rates start at $4.50 and go as high as $25.00 . Call for an estimate. Each ball is a plastic nest filled with approx. 3 oz. of alpaca fiber sheared from our herd. The fiber comes in 22 different colors/shades and we mix fiber color as we stuff each nesting ball. 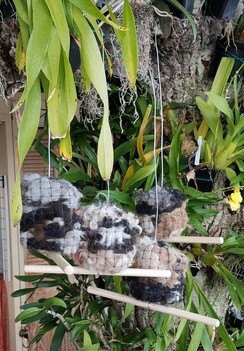 Each nesting ball sits on a 12" long wooden perch suspended on a 24" wire that is used to hang the ball from a tree or house eave. The fiber is not processed before being stuffed into the netting. These hand made nesting balls provide your backyard birds with the soft material, i.e. fiber they need to make soft nests for their young. FIber comes in 22 shades/colors from white, black, grey, browns, fawns, and beiges. If you want specific color(s) please contact us to see if we still have those colors available. We can make solid color nesting balls or mixes of specific colors. We shear our alpacas once a year in late May, so a color may not be available until the next shearing.